Updated July 11, 2015: The mod has been updated to version 6 for compatibility with the July 9, 2015 game patch. This is a suggested, but not required, update for users with the latest game patches as it updates the script with additional error checks. Starting with version 6 the mod's script is also contained in the new "ts4script" file format and can no longer be automatically installed with the Mod Manager. Simply place both files from the zip file you download into your mods folder. You will still need to ensure that scripts mods are enabled in your game options and, as always, if you update the mod, be sure to delete the old version! This mod will queue an action to put a book back on the shelf once a sim has finished reading. If the sim cannot find a bookshelf close enough that is available, they will place the book in their inventory. In addition, if the Place in World action is chosen for a book in the sims inventory, they will instead put the book on an available bookshelf. This mod is a bit different than most as it contains both a standard package file and a script mod. Both must be installed for the mod to work properly, but the installation isn't all that complex. Unzip both files contained in the main zip file you downloaded into your Mods folder. You should end up with a package file named 'MTS_Scumbumbo_PutBooksAway' AND a zip file named 'MTS_Scumbumbo_PutBooksAway_Script' in the Mods folder. 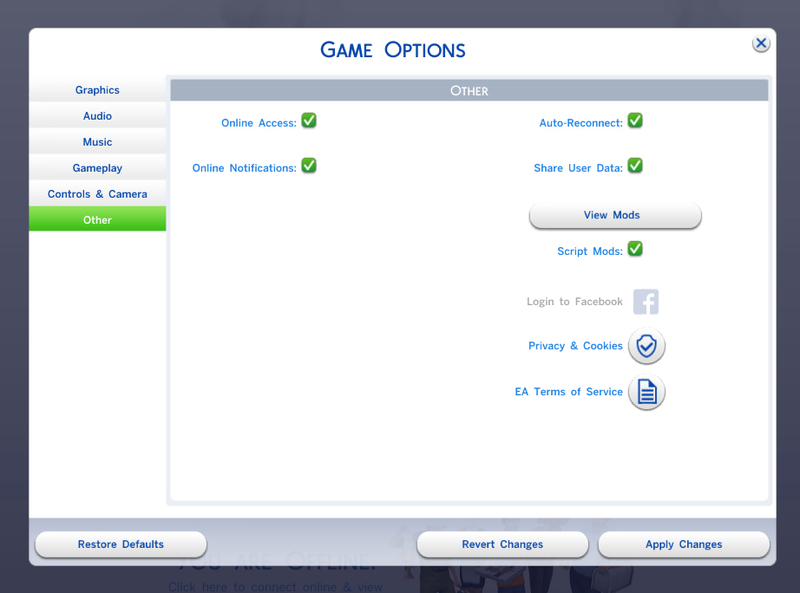 Make sure that scripting mods are enabled in the game options (on the "Other" tab). Be sure to check this setting after updating the game for a new patch, as if you don't turn off the show mods at startup option the game will disable scripts after an update is installed. If you need a reference for how this should be setup, see my Keep Instruments In Inventory mod and there is a screenshot there of a similar installation. 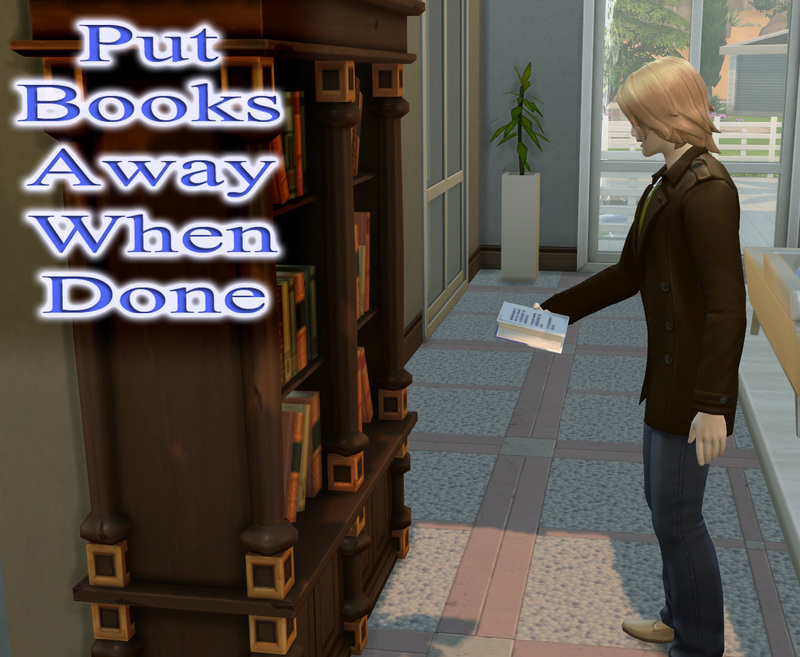 Without the script portion of the mod, visiting sims or sims on community lots can pick up books and steal them! If you wish, the package file can be placed in a subfolder, but the zip file must go into the main Mods folder. This mod requires the Windows version of The Sims 4 to be patched to at least version 1.3.18.1010 (December 16, 2014) or newer. Use version 6 for games updated to version 1.9.80.1020 (July 9, 2015) or newer. This mod may conflict with any other mods that modify the strategy for reading or putting down books or other objects. It is compatible with the Keep Instruments In Inventory mod. As this modifies the generic strategy for putting down any book, it should continue to work for any new books added to the game. The script portion of the mod replaces the _run_interaction_gen() function in the carry.put_down_interactions script. More details can be found in the description of the Keep Instruments In Inventory mod. The script source is included in the zip file and can be included in similar mods. It would only be required if sims could feasibly steal objects from other lots without it. If you do include this in another mod, I do expect to be credited! Download only one of the versions available. Make sure your game is patched to the requirements for the mod version you are using. PutBooksAway_v6.zip | Description: TS4 mod to make putting books back on the shelf when finished reading the default.